A student eats and works at Fran's Cafe. Northwestern has instituted several new dining policies for next year. 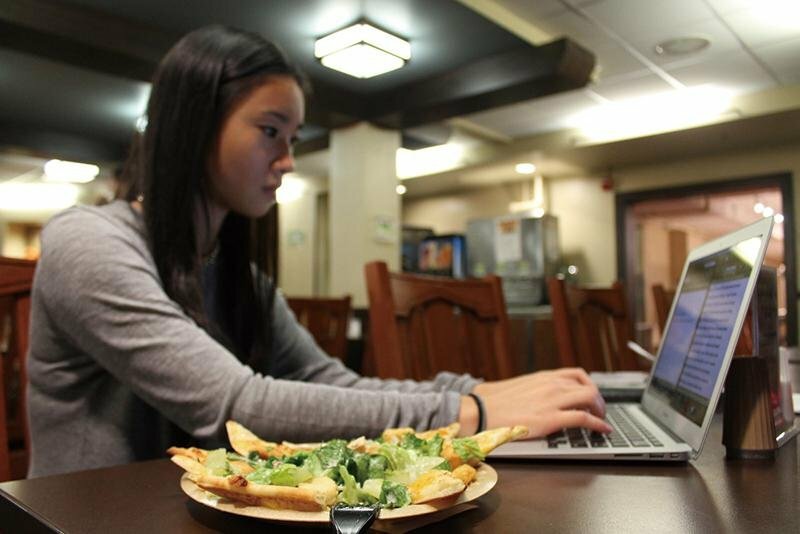 Freshmen will be required to purchase the unlimited meal plan as part of a series of dining changes related to Northwestern’s new two-year on-campus living requirement that administrators hope will increase student engagement with on-campus dining. Director of dining Ken Field said he hopes changes in cost, as well as forgoing equivalency meals in favor of additional dining dollars, will make living on campus more enticing, particularly to students dismayed by the recently instituted two-year live-in provision. By utilizing several student focus groups, the University was able to reduce costs — the unlimited, or open access, meal plan is now about $500 less expensive than in past years, Field said — and made other changes based on what students said they wanted. Sodexo general manager Buzz Doyle said that Sodexo also used the information from the focus groups, student dining partners across campus and industry data about student dining habits to decide what would best serve the Northwestern community. Doyle and district executive chef Chris Studtmann both highlighted the increase in plant-based nutrition coming this year, as dining tries to focus on providing healthy meals all day. Previously, equivalency meals with varying values based on the time of day were used to buy food at non-dining hall locations, but that option has been replaced with a more flexible system. In the past, students had to use their weekly allotment of equivalency meals by Saturday evening, or they would not roll over into the next week. Field said that students in focus groups said they were often stressed by this hard deadline and ended up using their equivalency meals on things they didn’t want or need, just so they wouldn’t go to waste. In addition, dining dollars will roll over until the end of the school year, Field said. The block meal plan, which gives students a set number of meals at the start of the quarter, is now only offered to juniors and above. While the block plan includes fewer meals now, it does include more dining dollars, Field said, as well as a “considerably” reduced price. In addition to revamping meal plans, Foster-Walker Complex’s late-night dining is getting a makeover, as well. Local restaurants such as Tomate Fresh Kitchen and Hecky’s Barbecue, which were featured in dining halls last year, will likely return on a monthly basis, Field said. Field added that Elder Hall will offer breakfast, lunch and dinner and will be the only dining hall on campus to offer carry-out dining, where students will be given a container to take food with them.